Elite Gutter Service stocks a wide variety of 5″ & 6 ” gutter colors. Also, an almost never-ending special order line is available that makes nearly any color in the rainbow available. Please Note: Due to the technical difficulties of displaying colors electronically accurate, these images are a close representation of the actual colors, given to illustrate the range of colors available. Alcoa Home Exteriors is a leading U.S. manufacturer of premium certified siding, aluminum trim and injection-molded shutter and accessory products for the residential remodeling, new construction and light commercial markets. Alcoa Home Exteriors manufactures and markets more than 3,000 coordinated products. The expansive portfolio presents color and design solutions in a variety of architectural styles for home exteriors that offer lasting beauty and proven performance. Easy to maintain, Alcoa’s products are backed by “best in the business”‘ warranties. Gutters and downspouts are the shoes and handbag of an exterior. Your home simply can’t be well-dressed without the right combinations. The Rollex Designer Collection offers you the choice of 35 traditional and contemporary colors that will match or complement your siding, soffit and fascia colors. Rollex gutters are tough enough to handle the crush of leaves, debris, snow, ice, nesting varmints, whatever. They’re fabricated from heavy-gauge aluminum with an acrylic finish baked on – inside and out. They don’t leak. They don’t sag. They don’t take early retirement. Rollex rainware is available in all the traditional and contemporary colors shown below. They’ll match or complement your Rollex siding and fascia. 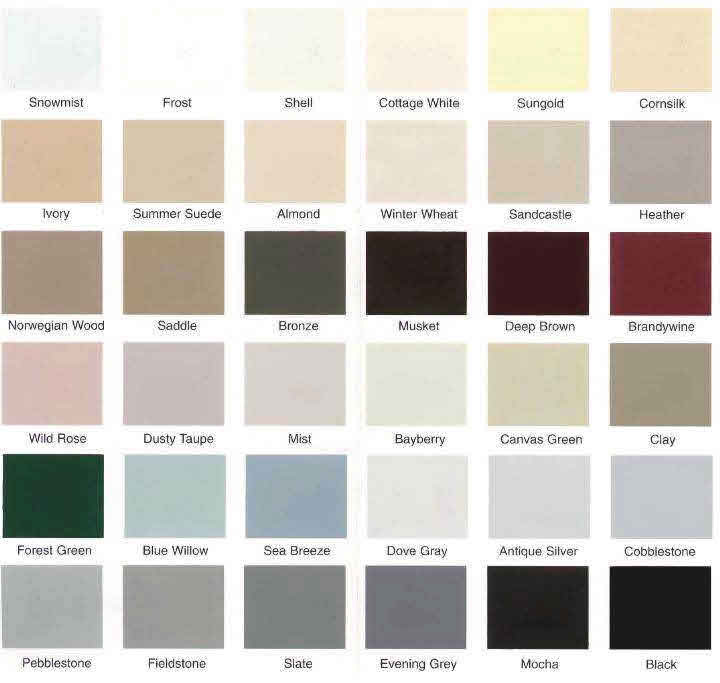 The colors below are available in the Rollex gutters and downspouts.